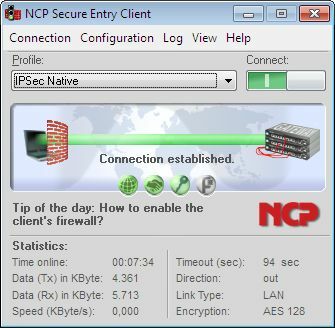 NCP Secure Entry Client for communication with any IPsec gateway. Supports all transmission networks like ISDN, the analog network, xDSL, Internet, GSM, 3G, LAN, WLAN, and it runs under all Windows operating systems (also Windows 7). Authentication is executed either through OTP tokens or certificates in a PKI. The permanently integrated Personal Firewall shields the PC against attacks.Support for: Triple DES 128, 192-bit, Blowfish 128-bit. ...... All security mechanisms are already active when the system starts and they remain active until the Entry Client is deactivated. IP-NAT, Stateful Packet Inspection, defined filter rules, Friendly Net, and hotspot detection (automatic detection of the current network environment and activation of the corresponding filter rules). Authentication relative to the destination gateway can be executed via OTP tokens or certificates (soft certificates, smart cards, USB tokens) in a PKI, at your discretion. All data are encrypted for transmission. Qweas is providing links to NCP Secure Entry Client for Win32/64 9.30.146 as a courtesy, and makes no representations regarding NCP Secure Entry Client for Win32/64 or any other applications or any information related thereto. Any questions, complaints or claims regarding this application NCP Secure Entry Client for Win32/64 9.30.146 must be directed to the appropriate software vendor. You may click the publisher link of NCP Secure Entry Client for Win32/64 on the top of this page to get more details about the vendor.